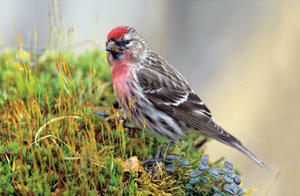 Keep your feeders full and look for birds associated with "irruptions". When natural winter food supplies are scarce in northern Canada, numerous bird species "irrupt", migrating south in search of food. The most common irruptive birds are Red-breasted Nuthatches, Pine Siskins, Purple Finches, Common Redpolls, and Evening and Pine Grosbeaks. Lovers of millet, you can attract Juncos to your yard by offering WBU Deluxe LM Blend in a ground feeder or hopper feeder. They’re persistent foragers and have been known to burrow through snow in search of seeds. 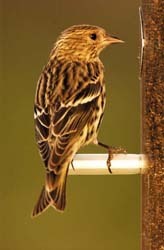 These “winter finches” are attracted to WBU Finch Feeders filled with Nyjer®. You can also attract them to your Seed Tube Feeders by offering blends with sunflower chips like our WBU No-Mess LM Blend. If they’re visiting your yard, be ready - they are hungry birds. For best results, offer WBU Choice or Supreme Blend in a Hopper Feeder. Before the 1850s, Evening Grosbeaks were not commonly found east of the Rocky Mountains. Now, winter irruptions can occur across the country. They have declined tremendously in our area! Let us know if you see any!! !